Malware-Traffic-Analysis.net - 2016-07-07 - PizzaCrypts... Really? Saw a campaign noted on malwardomainlist.com that used Neutrino EK to send ransomware. This ransomware prominently used the term "pizzacrypts." Thanks to Malware Domain List for the info from their website at http://www.malwaredomainlist.com/mdl.php. Shown above: My initial tipper for today's traffic. This ransomware might be associated with the term "pizzacrypts," but the Proofpoint ET rule I saw on the post-infection traffic was created in early- to mid-June 2016. Shown above: EmergningThreats rule hit on the post-infection traffic. Shown above: Whois data on pizzacrypts.info, registered 5 days ago. 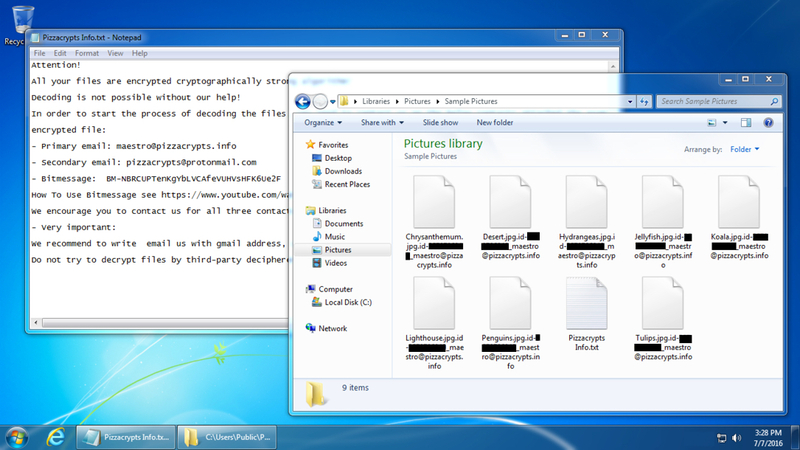 Shown above: Desktop of the infected Windows host.